RISE Credit Review: A Solution for Emergency Cash? RISE offers short-term loans designed to help consumers get out of financial binds. Learn all about them, how their customer service has led to low ratings, and whether they’re worth applying through. Consider this: A study from 2013 found that the median cost for a trip to the hospital was $1,233. If you’re like the majority of respondents in this GOBankingRates survey, you wouldn’t have enough to pay for this trip to the ER. 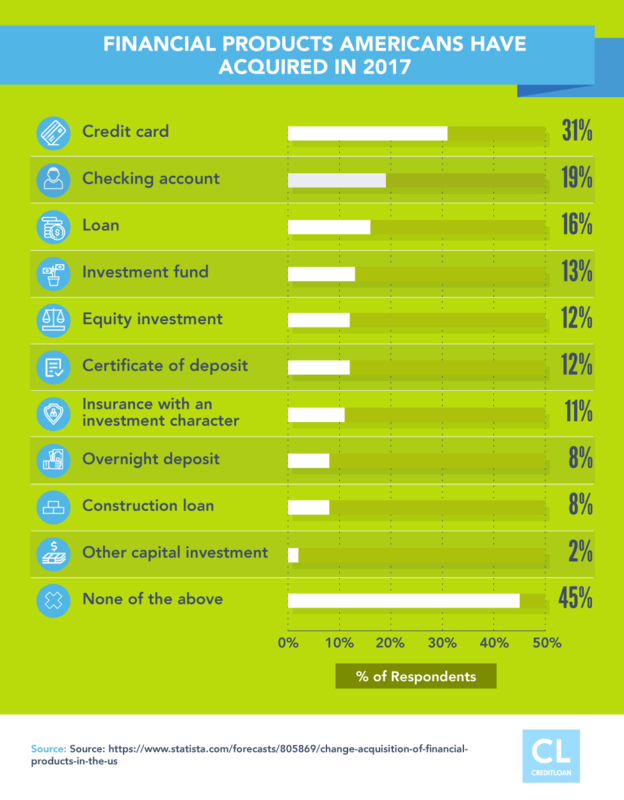 When asked, 69% of respondents said they did not have $1,000 in savings. That means that medical expenses, car repairs, or other emergencies could wipe out your entire savings and still not cover the entire bill. $1,000 in savings is not going to cut it when you have one of these types of emergencies. In short, RISE is an online credit lender that provides installment loans to those who need cash quickly or don't have access to other lending options. They’ll help you out by loaning a small chunk of change to get you through your tough time. In most cases, you’ll have the money deposited directly in your account so it’s available the very next business day. Interest rates vary by state, and some can be extremely high. The company even states on its website that: RISE is not the cheapest form of credit so it’s important that you understand the costs of your funds and your rights as a borrower. 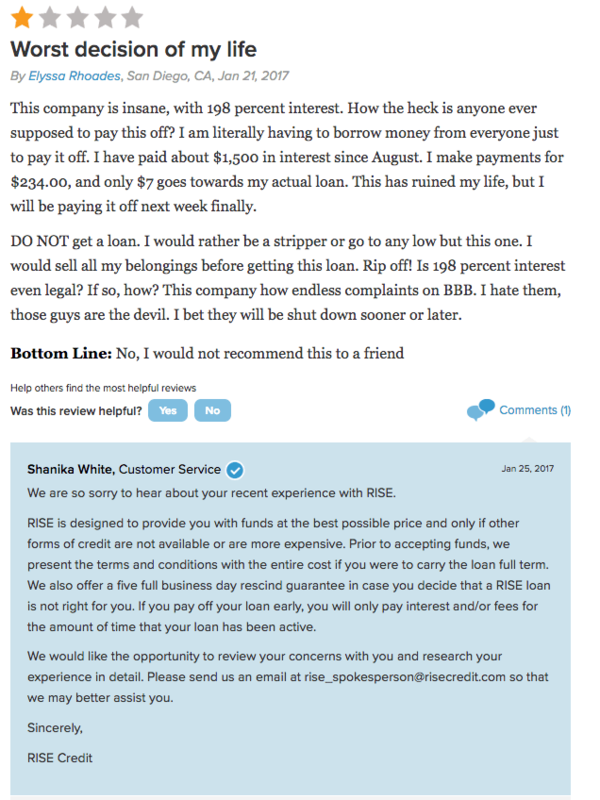 Customer reviews are mixed, and it is best to research the pros and cons before applying for a loan from RISE. Keep reading to learn more about RISE, including their strengths, weaknesses, and frequently asked questions about their service, so you have all the facts. They also have refinancing options for your current loan. Installment loans can be compared to a typical payday loan: you’re able to take out a small amount of money right away. In this case, between $100–$1,000. These loans are ideal for minor unexpected expenses that crop up. The good news is that unlike a payday loan, you’re not required to pay back your RISE loan as soon as your next paycheck clears. Instead, you can choose to spread your payments out over a longer period of time. Paying in installments—instead of all at once on payday—gives you the added convenience of smaller, more manageable payments so you can budget the rest of your everyday expenses instead of taking a large financial hit all at once. The maximum loan amount you can receive with a RISE installment loan is $1,000. But what if you need more than that to cover a big expense? RISE online loans are offered in higher amounts ranging from $500–$5,000 to give you more cash fast. Their promise of “honesty, transparency, and fairness” mean RISE online loans are free of hidden fees and inflexible payment schedules, according to their site. They ensure that your payments always “align with your pay dates” so you never have to worry about overdrafting your bank account just to pay them back. RISE coordinates your loan payments with your pay periods. If you get paid every other week, you’ll be expected to make a payment every other week; if you only receive a paycheck once a month, RISE will be happy with one monthly payment. You can also take advantage of their automatic payments feature. With this, RISE will send you a friendly email reminder about your upcoming payment before your due date. You’ll be able to check your funds to make sure you have enough cash in your checking account before RISE automatically deducts your payment amount from your account. This crosses off one more item on your already jam-packed to-do list and guarantees that your payments are never missed or late (which could incur late fees and raise your interest rate). RISE cash loans are a mix between installment and online loans: they can be used to cover an expense as small as a utility bill or as large as a medical emergency. This makes them the go-to option any time you need a bit of cash in a short amount of time. Cash loans also coincide with your paydays so you’re not shelling out money before you have it available in your account. And you can even set up automatic payments just like you would with online loans. Let’s say you decide to go with a RISE loan, but you need additional cash or want to see if you qualify for a lower interest rate. Certain customers may be able to refinance their loan and receive additional funds if they meet certain eligibility criteria. Information about the refinancing process is automatically made available and emailed to you once you meet the above criteria. From there, you’ll receive an entirely new loan. You’ll be qualified for at least the same amount of loan money you were approved for with your previous loan, and in some cases, you may qualify for more than your original amount. If you still owe money on your previous loan, this amount will be taken out of your new loan as a form of repayment. The money that’s left over will be deposited right in your checking account and you’ll begin repaying your new loan. Keep in mind that since this is technically a new loan, you’ll be subject to the current APR rates, which could vary (up or down) from what you’re currently paying. Additionally, your payment schedule and payment amount could also change depending on the terms of your new loan. All of this will be disclosed at the time you receive your new loan agreement so you’ll want to double check the terms before you electronically sign on the dotted line. 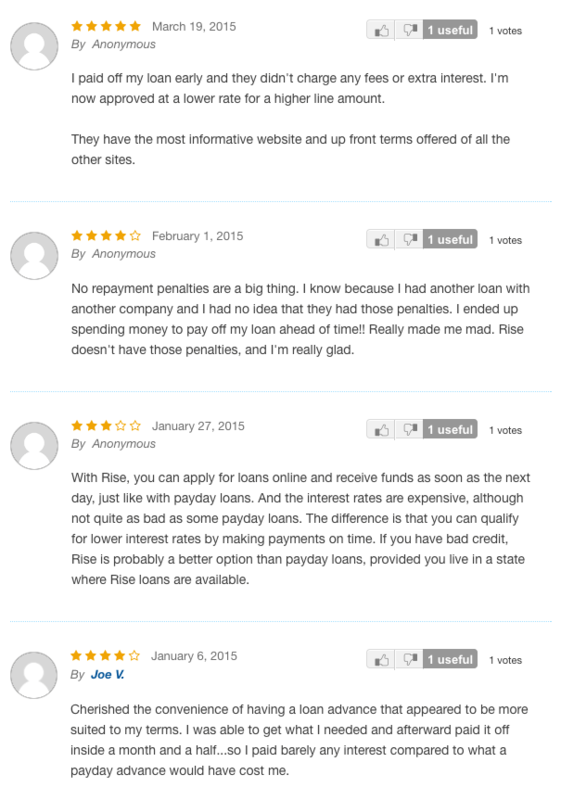 How is RISE Different from a Payday Loan? Unlike a payday loan, which typically requires repayment of the loan in full as soon as you receive your next paycheck, RISE lets you pay back your loan in installments and even allows you to choose your payment schedule. This means you can stagger your payments so they’re not due before you receive your paycheck or when the rest of your bills are. RISE also gives you the option of paying off your loan early without facing any additional penalties or fees. This way you’ll only pay for the days you actually held the loan, not the full length of your loan term. The last key difference with RISE is that, should you need them again, you’ll see a 50% drop in your interest rate for future loans as long as you make consistent, on-time payments for at least 24 months. After another 12 months of consistent payments, your interest rate can drop to as low as 36% for your future loans. On the other hand, payday loans can charge interest rates as high as 700%—and you’ll probably never see a decrease in your APR despite your awesome pay-back history. Since they're an online provider, you can apply for a RISE loan online in the comfort of your own home, or anywhere else you’re connected to the internet, by navigating to their application page. Using their safe and encrypted portal, simply fill out an online application, provide your email address, social security number, and a valid checking account number, among a few other details, to get started. From there, your application is submitted for approval and is reviewed within seconds. Once your request is approved, you decide the amount you want to borrow and agree to the loan terms you like. How Much Can I Borrow from RISE? Generally speaking, a personal loan amount can range from $100 to $5,000 depending on the state you live in and how much you’re actually approved for. RISE will use your credit history and a few other financial factors to determine your final loan amount. If you’re able to submit your application before 6pm ET and you’re approved, you could see the funds in your checking account the very next business day. Talk about immediate stress relief. In the small chance you’re not approved, the team at RISE will “provide a reason for denial” so you’re not left in the dark and know how to improve your application for next time. 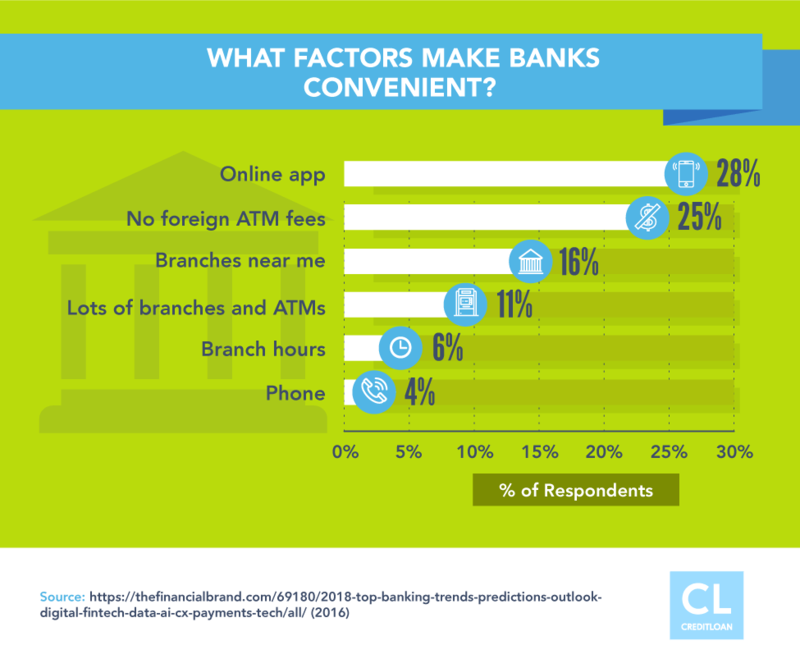 Sure, receiving cash when you need it most sounds great, but what’s it going to cost you? See, “rates and terms are customized to each customer and their financial situation,” according RISE. To determine your interest rate, RISE will use your credit history, employment, loan repayment history, and several other factors that indicate whether you’re a creditworthy borrower. While interest rates for payday loans can be anywhere from 300%–700% APR, RISE interest rates range from 36%–365%. Do those APRs startle you? And no, you’re not reading them incorrectly. Interest rates will also vary state-to-state. Interest rates for cash loans are definitely way higher than your typical credit card APR, which hovers between 12%–30%, but they also depend on which state you live in. Every state has their own unique rules and regulations for loans and interest rates so in addition to your financial qualifications, your rate will also depend on where you call home. The most common RISE loan in the state of California is $2,600 with bi-weekly payments of $241.44, and an APR of 224.35%. You can see this information presented in the handy graphic that accompanies each state’s specific borrowing options on the RISE website. Not only does each state offer different interest rates, but the terms of your loan agreement will also vary. That’s why it’s important to review everything in detail before committing to anything you may not understand or agree with. You can start by figuring out if RISE loans are even offered in your state. Speaking of terms, let’s dive into what you can expect from RISE. As we said before, every state has different terms RISE has to comply with. So before you can review the terms of your potential RISE loan, you must select the state that you live in first. Let’s use California and Utah as examples again. 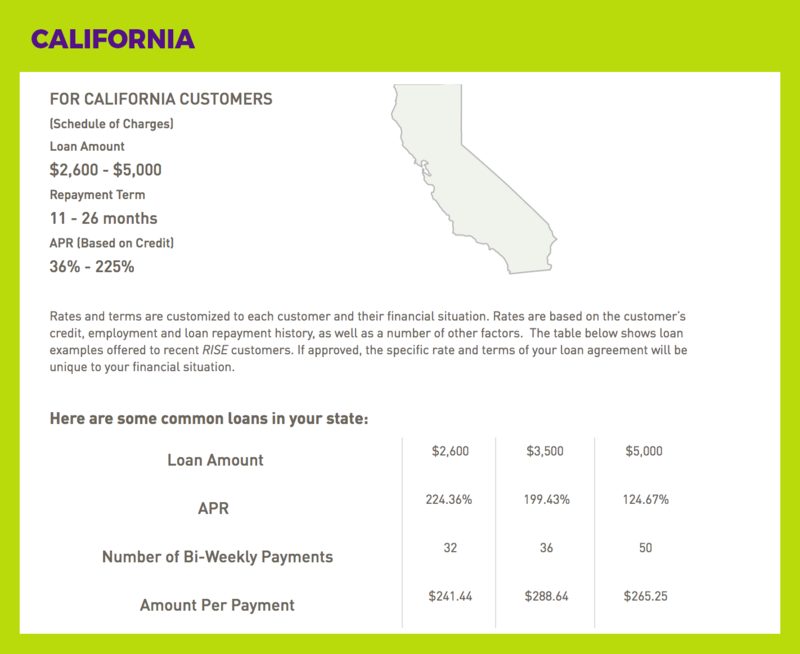 In California, RISE offers loan amounts between $2,600–$5,000, with a loan term ranging between 11–26 months, and an APR capped at 225%. That means you can’t get loans under $2,600 dollars and you also won’t experience RISE’s maximum APR of 365%. Residents are offered RISE loan amounts in the $300–$5,000 range, with loan terms between 4–26 months, and the standard RISE APR of 36%–365%. In Texas, RISE loans are capped at $2,000 and the repayment terms are only between 4–5 months! Now that you know how varied RISE’s lending terms are, be sure to take the extra time to find out the terms in your state specifically. After a quick Google search, you’re likely to find less than stellar reviews connected to RISE. 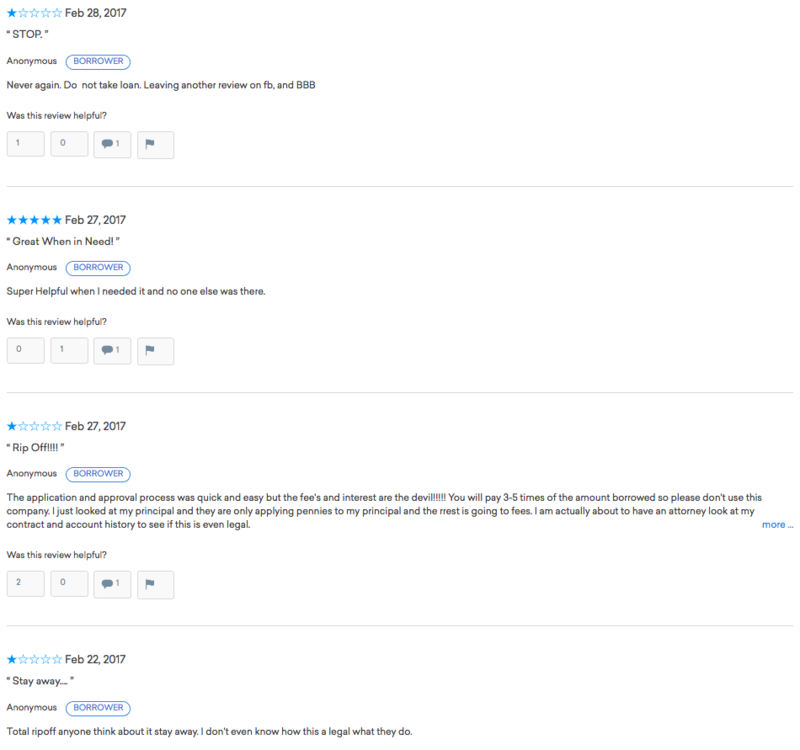 Let’s discuss a few of the top reviews to see what’s really going on. 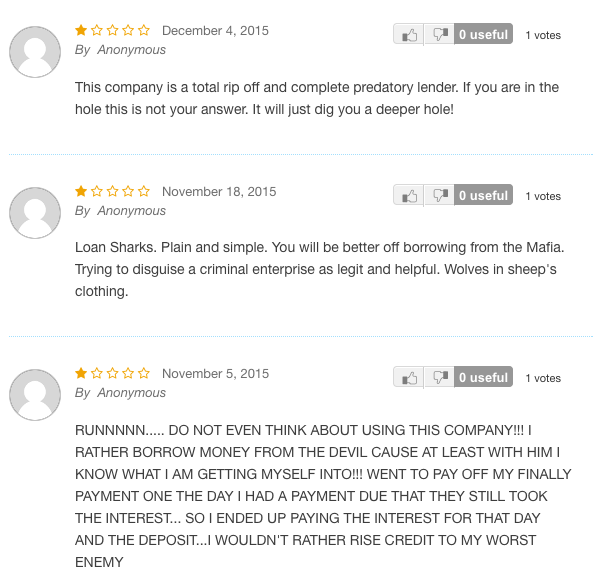 First, we’ll take a look at Credit Karma’s reviews on RISE. 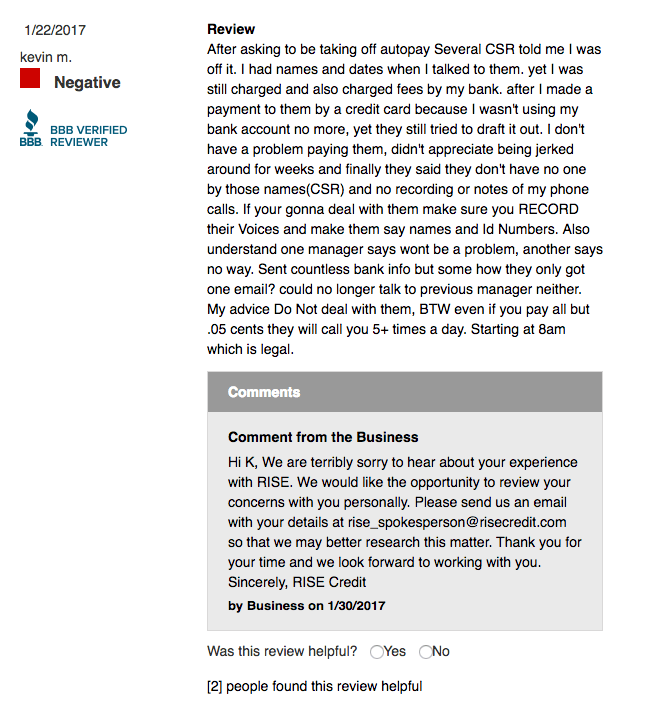 The image above isn’t pretty: 52 Credit Karma customers chimed in about RISE and had less than positive marks to give. While the application process received 3 out of 5 stars, the customer service rating dropped to a mere 2 out of 5 stars. What can we gather from this grab bag? Since we already know that RISE has higher interest rates than what most of us are used to paying for our credit cards, this should come as no surprise to reviewers who agreed to these APR terms when they became customers. Some experienced reviewers note that RISE interest rates are high, but not nearly as high as those you’d find by going with a payday loan. However, the company still received a lower score of 2 out of 5 stars because the bulk of the reviewers (48%) only gave them 1 star. For the most part, reviewers are somewhat vague as to why you shouldn’t use RISE. Most of them give potential customers a warning without really disclosing what went wrong. But is that the complete picture? 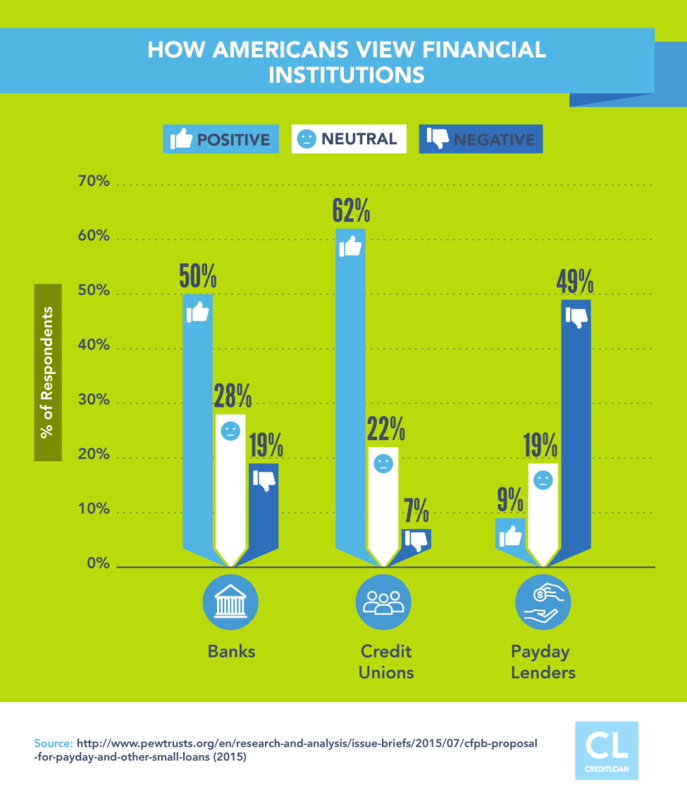 See, 44% of these Smartmoney reviewers rated RISE between 3- 5 stars. 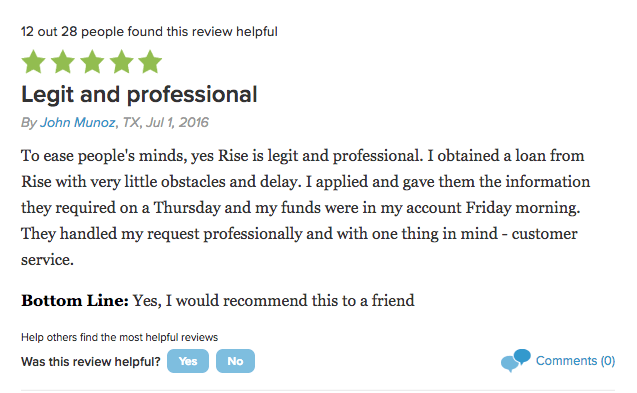 Happy customers report an easy, upfront process when signing up for a loan with RISE and were pleased to find the funds available the very next day as promised. Smart reviewers even admit to paying off their loan quickly to avoid paying a ton in interest like they would have with a payday advance. Remember, RISE doesn’t penalize you for paying them back early. Some experienced customers have even gone as far as saying that RISE loans are a better option than a payday loan if you have bad credit, which means interest rates may be more accommodating at RISE than your standard cash advance store. We also scoured more customer reviews from highya. Again, the rating is considerably low among these reviewers (1.2 stars with only 4% recommending to a friend), but at least we’re given a bit more information to go off of this time. 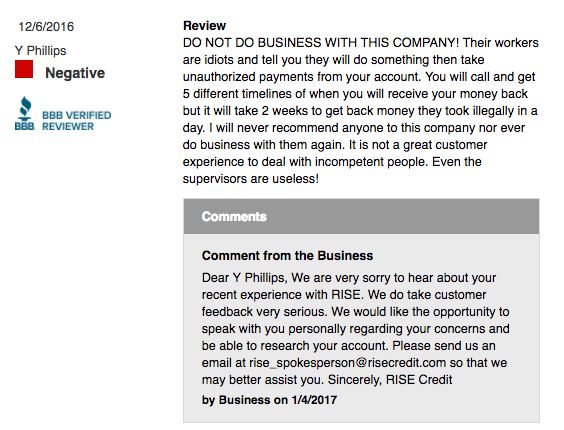 Plus, you can read the responses to these reviews provided by RISE representatives trying to resolve their customers’ complaints. The primary complaint in this example is one we encountered all too often during RISE reviews: exorbitant interest rates. 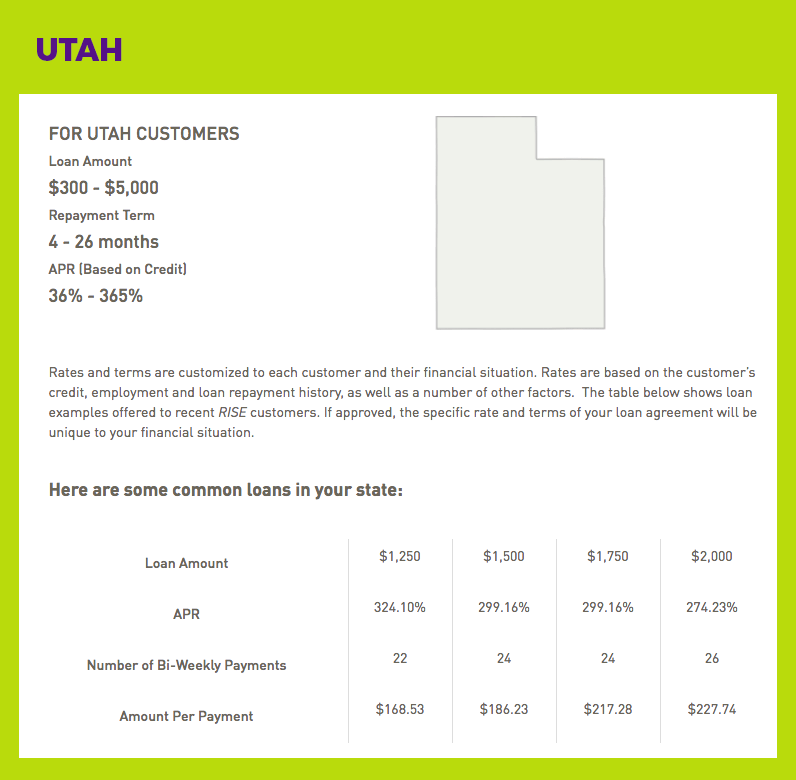 These next few reviewers complained of tech issues and personal banking issues, which are unconnected to the loan itself. What about RISE’s Better Business Bureau rating? Even though they’re not considered an accredited BBB business, they still received an A+ rating. That’s because the BBB awards high marks to companies that display honesty and transparency and work to resolve customer complaints quickly and to their customers’ satisfaction. Six reviewers gave RISE an average score of 3.68 out of 5 stars. For each negative review, a representative from RISE worked to address and respond to the complaint at hand. If we read this first review, Kevin M. had trouble opting out of the automatic payment feature. 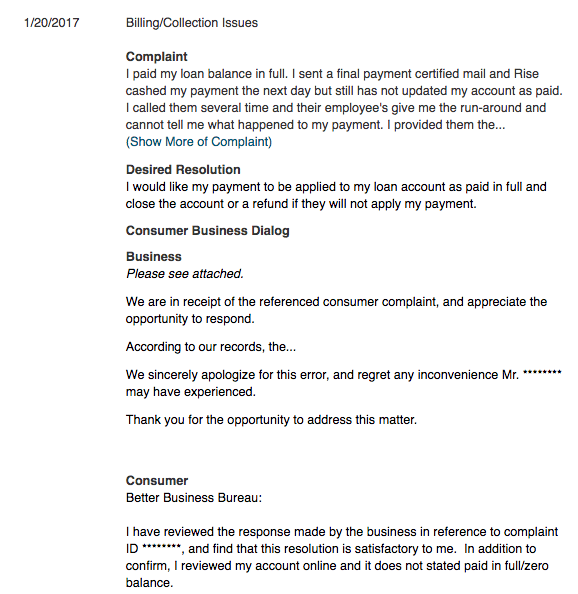 RISE responded and instructed the customer to reach out via email for more personalized help. In this next one, Bonnie H. had issues due to paying off her loan early. She claims she had to submit a 30-day bank statement three times since they were not formatted correctly. Another reviewer shared similar frustrations. 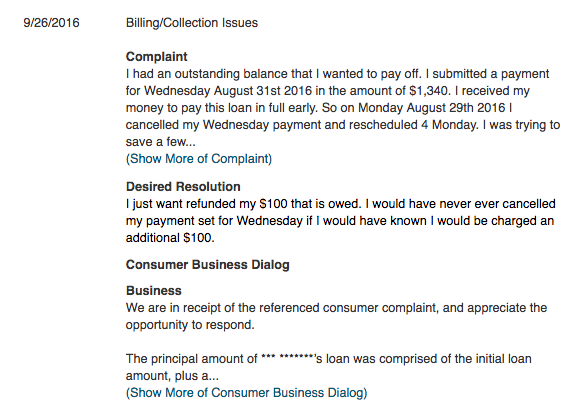 According to the complaint, the “company took unauthorized payments” and it took over two weeks for him to receive a refund. You could read 1,000 reviews and they’d all be different because we all bring different financial experiences to the table. So as with anything online, take these reviews with a grain of salt. If you’re ready to get started with RISE, let’s talk about what you need to do to make that happen. As we mentioned earlier, RISE is an online lender. This means you can complete the application process online anywhere you’re connected to the internet as long as RISE loans are offered in your state and you meet their eligibility requirements. If a RISE loan sounds like an opportunity you’d be interested in, you have to meet their basic requirements. If you don’t meet the requirements above, applying for a RISE loan won’t make any sense because you’ll be automatically denied. If you do meet all these requirements, you’re in the clear to start applying. Now that you know you’re eligible to apply for a RISE loan, all you have to do is fill out the free, easy online application. To do this, head over to their site and click on either one of the blue buttons that say ‘Apply Now’. From there, you’ll be directed to their secure application process which uses a 128-bit TLS encryption and continuous monitoring to keep your information safe at all times. Your progress during the 5-step application process is monitored using a tracker with five dots located just below the continue button to show you exactly how far along you are. Once you complete all five steps, you simply hit the ‘Submit’ button and wait for approval. According to their site, this is done within seconds so you’ll know right away if you’ve been approved. If you are denied, the company will provide a reason for this as well as give you the next steps you can take to try for an approval again. In many cases, RISE needs further verification information so they’ll just ask you to provide additional paperwork. From start to finish, RISE’s platform is as simple and straightforward as your favorite website. When you first land on their homepage, you’re greeted with a bright blue form that asks for a few key details about you to Get Started. By answering these four questions and hitting Continue, you’ll be on your way to working with RISE in a matter of seconds. For those not ready to jump in, there’s also a green ‘Learn More’ button down the page that leads to more information on the benefits of using RISE. When you’re convinced you have all the facts, their ‘Apply Now’ button in the top right hand corner links directly to their application. Their application form is laid out in a neat and orderly way so it’s easy to understand and fill out. If you happen to get stuck during the process, don’t sweat it — at the top right part of the form offers contact information for RISE’s customer support line. Just give them a call at 1-866-580-1226 and they’ll be happy to assist. After you submit your application and receive approval, you’ll be granted access to your very own RISE dashboard. From your dashboard, you’ll be allowed to make a payment, view your account balance and history, and learn more about how to build your credit. Overall, their clean, simple, modern design is very user friendly and draws very few complaints. As we saw earlier, customer service reviews are mixed. While most people complained about the high interest rates, others complained about multiple email and phone call follow ups, and a 10-day run around period, with customer service. Though these aren’t perfect reviews, we’ve also seen representatives from RISE reach out to customers offering to resolve their issues and rectify the situation. When it comes to their customer support, the team at RISE can be reached via email, phone, or direct mail to make contacting them convenient for you. Customer support can be reached by phone at 1-866-580-1226 seven days a week. You can also send RISE an email from their website, but there is a 24–48-hour response time. If you’re looking to send in forms or payments, you’ll want to use their mailing address or fax number (866-580-1228). With three easy ways to get in touch, you’ll have the help you need in no time. As a company, RISE has only been around for a few years — they opened their virtual doors on January 6th, 2014. 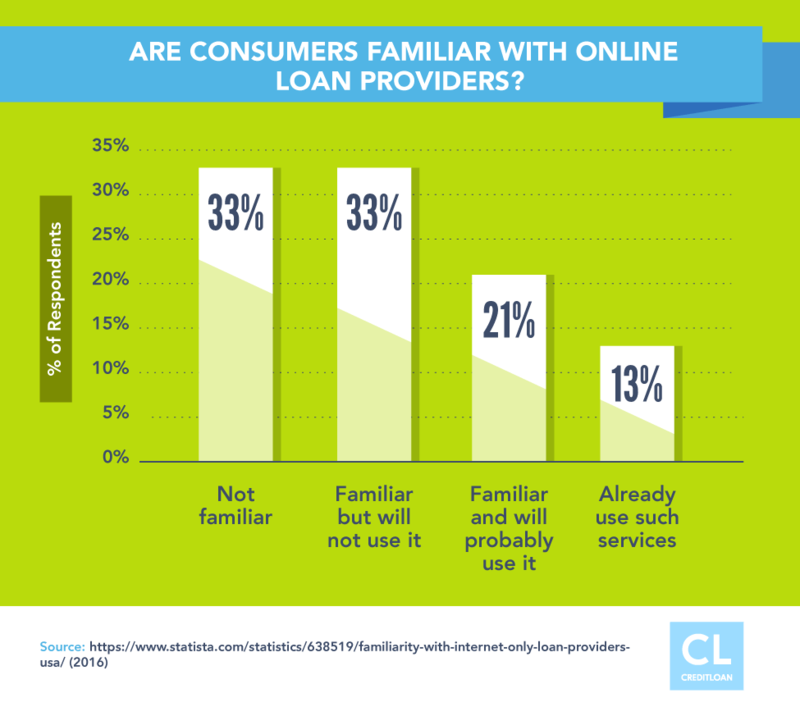 However, they’re not entirely new to the lending scene. The company originally started as Think Finance back in 2001, and “operated as ThinkCash and offered loans under PayDay One,” as Consumerist points out. After dealing with those allegations and revamping their brand, RISE Credit was born. So the question remains, is it legitimate? 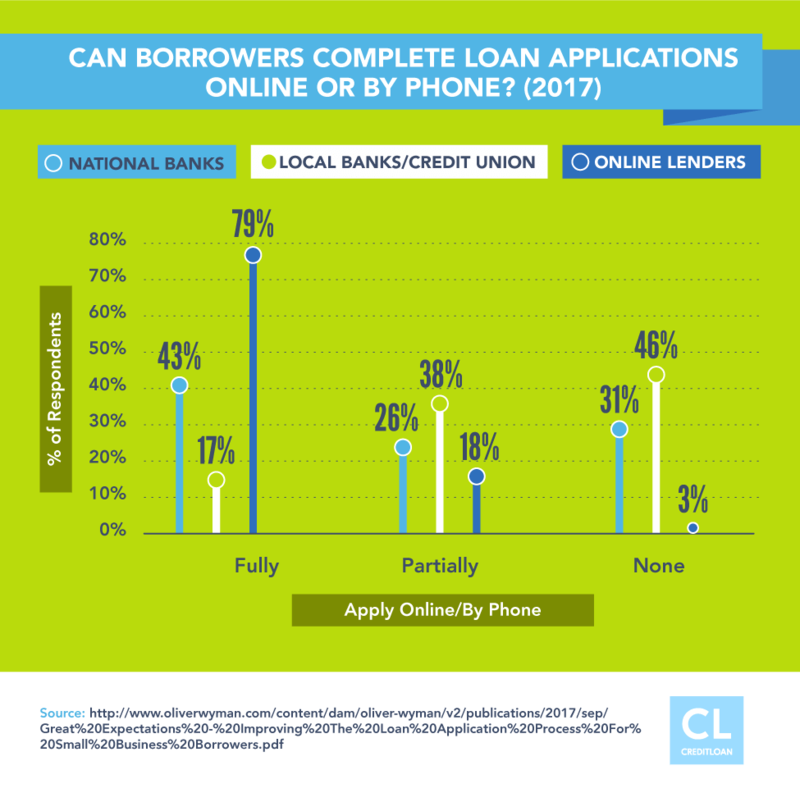 The Better Business Bureau gave it their highest rating (A+) and it’s currently operating legally as an online credit provider offering loans in 15 states. You may be wondering if you can trust RISE with your private financial information. For your protection, RISE uses “security measures that comply with federal law,” which means both their computers and files are protected against malicious hacking attacks. 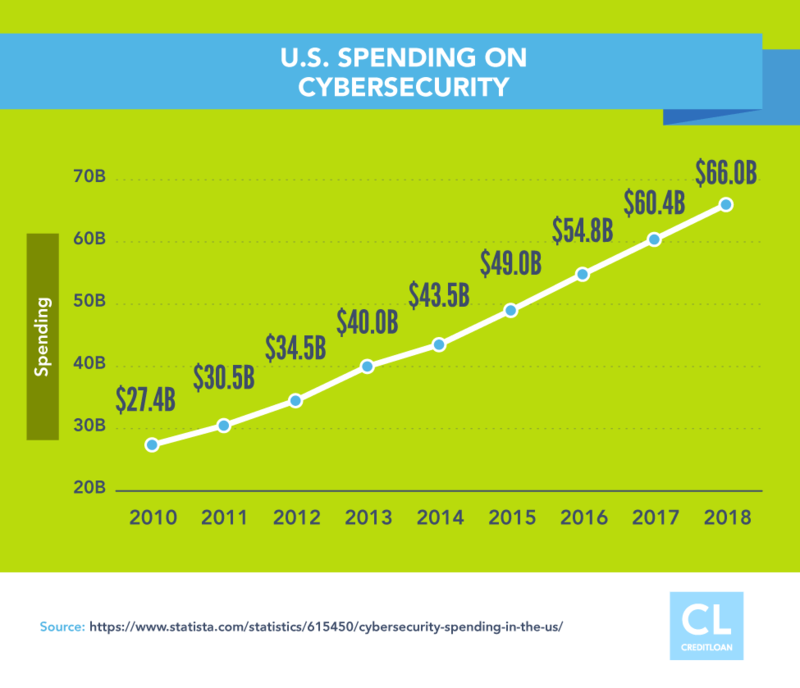 They also utilize “physical, electronic, and procedural safeguards (i.e., computer virus protection software, firewalls, 128-bit Secure Socket Layer),” to keep your personal information safe. According to their site, as long as you have a regular source of income, you don’t need a job to be approved for one of their loans. As long as you make your payments, your interest rate on a future loan can drop by as much as 50% should you need to borrow more money again. To qualify for this, just make 24-months of on-time payments, which is easy to do if you take advantage of their automatic payments feature. After you make another 12 months of consistent payments, your interest rate can drop to as low as 36%. Unlike payday loans, you’ll be rewarded for being a responsible borrower the longer you use RISE’s services. There’s nothing worse than having a bill due before you actually get paid. How are you supposed to avoid a late fee if you literally don’t have the funds to hand over? With RISE, you won’t have to deal with this frustrating inconvenience. Their flexible payment schedule gives you the option to coincide your RISE payments with your paydays. Get paid bi-weekly? You’ll have payment dates after each pay cycle. Only receive income once a month? RISE will give you one monthly payment. You’ll never have to float money before you get paid with RISE. This saves you from the crippling, endless cycle of payday loan debt. And if you decide to pay off your loan early, you won’t be penalized or hit with any extra fees. Talk about flexibility. Let’s say you hear back from your insurance company and you’re no longer on the hook for a large emergency medical bill — or your car repair estimate was quoted much higher than it actually turned out to cost — and you don’t need the cash from the loan you applied for. No problem! You have five days to refund your RISE loan risk-free. 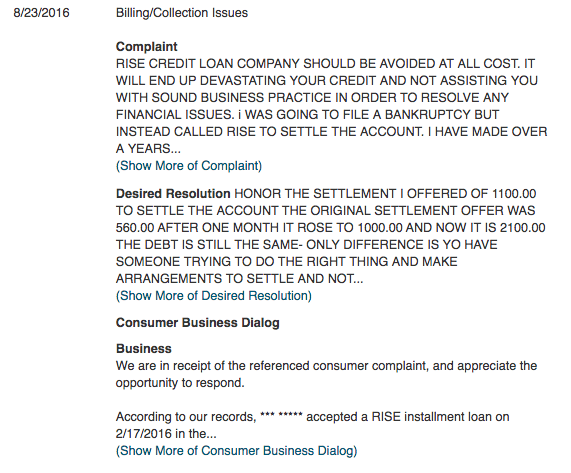 A simple phone call to RISE’s customer service is all it takes to refund your loan. You’ll be free and clear without having to pay any additional fees. This also gives you a few days to really think about and determine if you do in fact need the loan without the risk of penalty for changing your mind. Your credit score and payment history is directly linked to your loan’s interest rate (and all the other APRs you encounter between your credit cards or mortgage). To qualify for the lowest interest rates (and pay the least amount in interest charges), you’ll want to raise your credit score as high as you possibly can. Thanks to RISE’s Credit Score Plus, you’ll have a free way to stay on top of your credit. This perk provides you with instant access to your TransUnion® credit score every month, as well as free monitoring and tracking over time. You can even set up credit alerts to monitor your progress and watch your credit score improve as you continue to make smart financial decisions. Sure, you definitely want to repair and build up your credit, but maybe you’re a little confused about how to actually make that a reality. Check out the RISEFinancial Wellness center — another free feature offered to their customers — for a crash course in credit improvement. By using these free valuable resources, you’ll be on the right track towards improving both your credit and your financial future. We’ve covered all the ins-and-outs of RISE’s services and we highlighted their six biggest strengths. While the annual percentage rates, or APR, on a RISE loan range from 36% to 365%, they’re certainly an expensive option when you need cash fast, but they’re not unheard of. A typical payday loan can charge APRs as high as 700% though they typically average as much as 400%. So yes, the APRs for RISE loans are high when you compare them to the 12%–30% APR you’re paying on your credit card, but it’s a much more affordable option than your standard payday loan store. Additionally, every state has certain rules and regulations regarding loan APRs. Depending on your state, your APR could be capped at 99% like in Illinois or 60% in Georgia. That’s quite a big difference from 365%. The best route you can take to guarantee low APRs? Bring up your credit score, always pay your bills on time, and try your best to maintain a low debt-to-income ratio. Even though RISE may make sense if you’re looking for a short-term loan, you can’t apply for one in every part of the country, despite the whole application process taking place online. 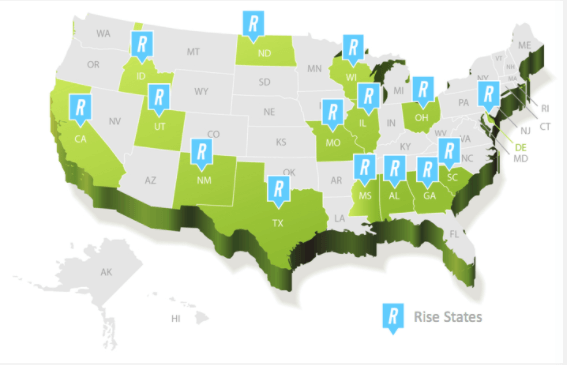 RISE is only available in 15 states, so if you don't live in one of them they won’t be able to approve a loan for you. When you have to file for bankruptcy, your credit score usually takes a nosedive. This will affect your ability to get low interest rates when applying for any type of credit or loan in the future. 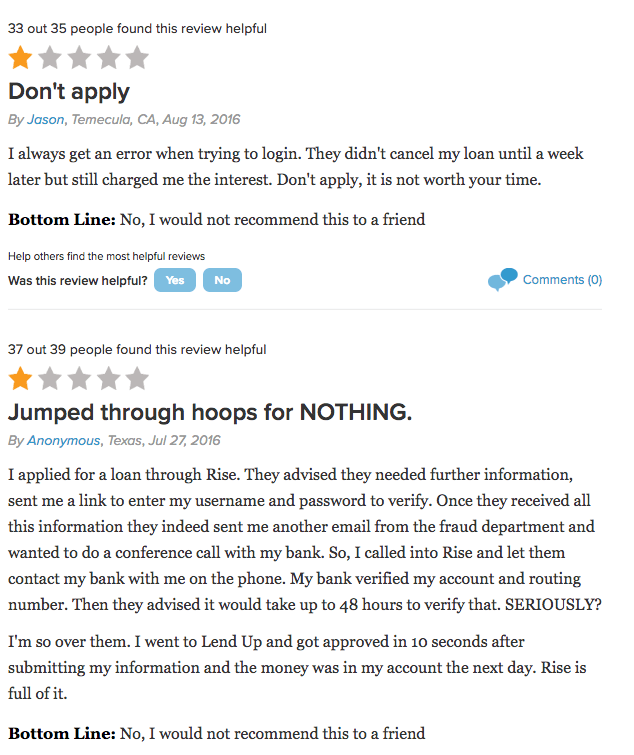 Unfortunately, when RISE reviews your application and notices a bankruptcy, you won’t be able to qualify for one of their loans. 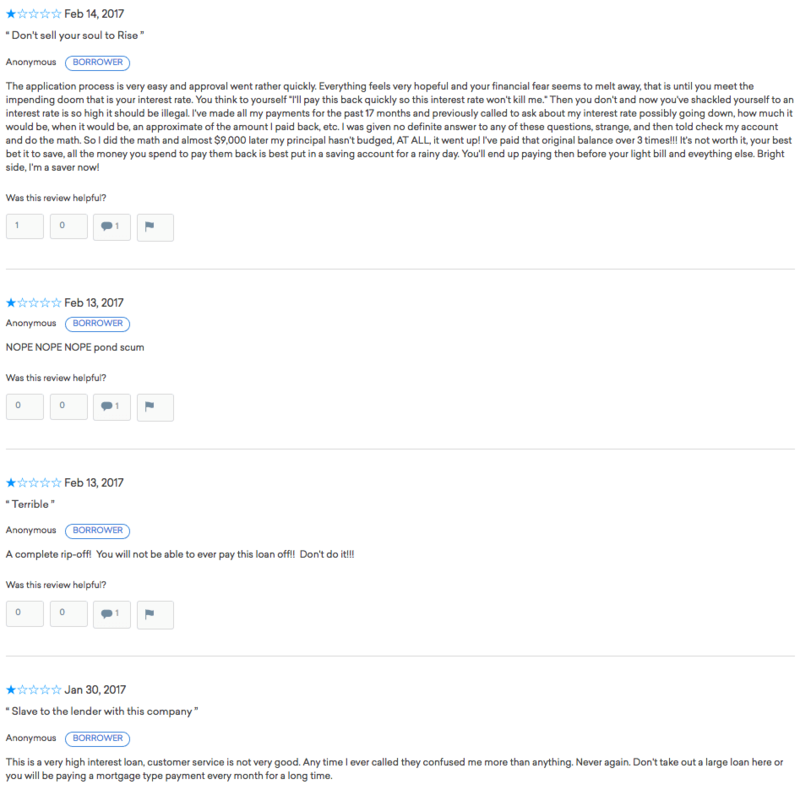 After scanning dozens of reviews, the consensus is clear: the RISE phone support team needs some work. Several customers have complained about long hold times, miscommunication, and being given the runaround from RISE support staff. However, you can reach RISE customer service 7 days a week by phone at 1-866-580-1226, and anytime via email from their website (just expect a 24–48 hour response time via email). Can I defer a payment with <em>RISE</em>? Technically, your first payment with RISE is considered deferred due to the fact that the funds become available to you before you start making actual payments. But you’ll need to make your loan repayments in accordance with your payment schedule after this time. They flexible payment options so you can set yours up to fit your financial needs. If you lose your source or income or suffer another type of financial hardship which may cause you to miss your scheduled payment, contact customer service immediately and they may be able to work out a new payment schedule so you’re not forced to miss or make your payment late (and face extra fees). Though RISE does not offer additional deferred payments, they do provide a 7-day extension period if you need more time to gather funds. You never want to just skip a payment, because they report your repayment history to all three credit bureaus and late or missed payments negatively affect your credit score. How do interest rates decrease over time? Unlike a payday loan or cash advance, the more on-time payments you make with RISE, the better your future interest rates will be. So as long as you’ve made 24 consistent, on-time payments, you could qualify for future interest rates that are half of what you were paying with your original loan. If you continue to be a model of creditworthiness for another 12 more payments, you’ll receive an APR rate as low as 36% for any future loans or credit extensions with them. Therefore, the more on-time payments you make and the more you use RISE, the cheaper your rates will be. Can I have two <em>RISE</em> loans at the same time? At this time, you cannot have two outstanding loans with RISE at the same time. If you need money from a second loan before your original one is paid off, refinancing your loan with RISE may be an option. When you qualify for a refinance, the option will automatically appear in your RISE dashboard account. You’ll need to agree to a new loan—which may come with different terms, APR, and payment schedule—before you receive your additional funds. If you still owe money on your previous loan, this will be deducted from your new loan amount before it’s deposited in your account. So you’ll have the convenience of receiving additional cash courtesy of your new loan without having to open two at the same time. 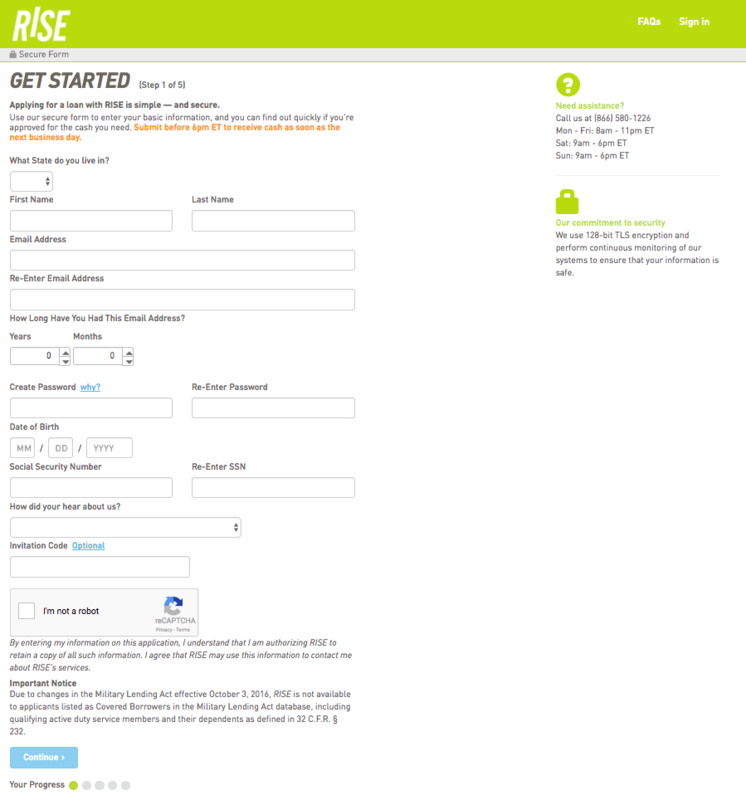 Will I get multiple calls/emails after signing up with RISE? When you submit your application to RISE, they will share some of the personal information you submitted with other financial companies in an effort to use joint marketing. This may sometimes result in random companies getting a hold of your phone number or email address to market their services to you. While you can’t turn off the sharing of certain items, you can call the RISE customer service number at 1-866-580-1226 to limit the information that is being shared. What is RISE’s BBB rating? Even though RISE is not an accredited business, they’ve earned an A+ rating from the Better Business Bureau, which is the highest grade any company can achieve. Their dedication to satisfactorily resolving customer complaints in a timely manner earns respect from the BBB. Does RISE run a credit check or affect my credit score? While some payday loan retailers don’t require a credit check, RISE will perform one before giving you an approval for a loan. A “soft” credit check gives lenders information such as your credit score, payment history, bankruptcies, and other financial information associated with your credit history – all typically used to determine your interest rate. This kind of check does not affect your credit score. As long as you’re not opening multiple lines (and varying types) of credit all at once and in a short period of time, the RISE credit check should not hurt your score. Conversely, a “hard” credit check will give lenders the same information (in greater detail and specifics), but it will lower your credit score by no more than five points. When RISE checks your credit, they’re not only trying to determine a correct APR according to your borrower risk, they’re also looking for bankruptcies. 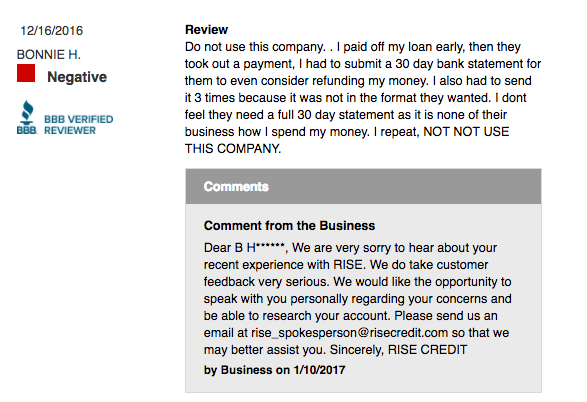 RISE will not approve you for a loan if you filed for bankruptcy. What are the most common complaints about RISE? When “a whopping 66 million U.S. adults have zero dollars saved for an emergency,” according to a study reported by CNBC, most Americans can’t afford to pay for an unexpected financial expense if one strikes. With an intuitive online platform, super easy application process, and interest rates that are way lower than those you’d find at a payday loan store, a RISE loan makes financial sense for those requiring a short-term loan under $5,000. However, due to their low ratings, it's in your best interest to research your options before applying. There are plenty of options if you're in need of a quick financial fix, eight of which we've recommended right here. Don't settle for a lender until you're sure they're going to provide you with the money you need, on terms that you're comfortable with. Have you used RISE before? What was your experience – good or bad?